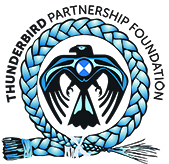 The Thunderbird Partnership Foundation is the result of a merger between the National Native Addictions Partnership Foundation (NNAPF) and the Native Mental Health Association of Canada (NMHAC) that occurred on June 25, 2015. This new national organization brings together the efforts of these organizations to develop and support holistic healing approaches of the First Peoples of Canada as defined within the First Nations Mental Wellness Continuum Framework and the Honouring Our Strengths Renewal Framework. Together, the organizations that form the Thunderbird Partnership Foundation represent some of the most current and promising thinking about holistic healing and wellness within the First Peoples communities of Canada.